Namespace The module’s routines are arranged by namespaces and then by classes. Note that if you select this value, the native-code modules will be empty, since native-code applications do not contain namespaces. Class The module’s routines are arranged by class names. Routine The list holds only module’s routines. Routines are displayed in the format class_name.routine_name. Source File The module’s routines are arranged first by source file names and then by class names. Unit The module’s routines are arranged first by unit name and then by class names. If you select this value, the .NET modules will be empty, since .NET does not use the term unit. Package The module’s routines are arranged by Java packages (namespace analogues in Java). Default This value selects optimal variant for each module in the Setup panel according to the module’s “nature”: suppose, you have a .NET and a native-code module in the Setup panel. If you select Namespace from the View by box, the native-code modules will appear empty. If you select Unit, the .NET module will be empty. The Default value lets you apply complex condition: the routines of .NET modules will be arranged by namespace, the routines from native-code modules will be arranged by units. That is, if you select Default, AQtime will apply the Namespace criterion for .NET modules and the Unit criterion for native-code modules. To add a module (managed or unmanaged) to the project, select Add Module from the Setup toolbar or context menu. Drag the desired file from Windows Explorer to the Modules pane. 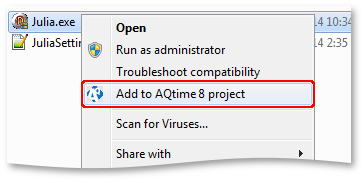 Right-click the desired file in Windows Explorer and select Add to AQtime 8 project from the context menu. To add a .NET assembly to the project, select Add Assembly. To profile a script from a web page and add the page to the project, select Add URL. By default, the module that was the first to be added to the project remains the “main” module (it is displayed in bold). AQtime launches it when starting a profile run. Other modules will be loaded by this one as it runs (or possibly not loaded). If you want to make another module the “main” module, select it and then choose Set As Active from the Setup toolbar or from the context menu. To remove a module from the project, select it in the Modules pane and then choose Remove from the Setup toolbar or context menu. You can also replace the module with a new one by right-clicking the module and selecting Replace. By default, AQtime profiles all of the units that are supplied with the module including the modules that are embedded by IDEs, like MFC and VCL. However, generally, those units cannot be modified as their source code is not available, and therefore standard units are not worth profiling. To hide the standard units, enable the Exclude standard source files option of the General Preferences dialog, or press the Exclude Standard Source Files button located on the Setup panel. AQtime can ignore unnecessary routines and files. In this case, it excludes them from the Modules pane and considers them as absent. To customize a list of ignored files and routines, select Options > Options from AQtime’s main menu and choose General > Ignore Files and Routines. For more information, see the description of the Ignore Files and Routines dialog. You can quickly locate a routine in the Modules pane without opening each module, by using Find on the context menu or on the Edit menu to call the Find dialog, or simply Find Next.